Assault Models is a company that revolutionized military figure industry by introducing 3D scanned miniatures to the market. The technology comprises of taking a three-dimensional image of a real person, processing the image, scaling it down to 1/35 or any other scale, and 3D printing the figure. The end result is a miniature copy of a scanned person, with a level of realism which is hard to match even by the most talented figure sculptors. Afghanistan, 2011-2012 (AM35017) is one of the latest 1/35 scale additions to the company catalogue. The figure was also offered in 1/16 scale, a real treat for large scale enthusiasts. The pieces are cast in grey resin. The resin looks really good and I couldn't find any imperfections in the cast whatsoever, with lots of sharp details nicely delivered in scale. Check out the thin radio antenna... casting such a delicate piece in resin is very impressive. Carrier blocks are large, but easy to remove without damaging the parts. The resin feels a bit soft under the x-acto blade, however I had no problems during the cleanup process. The first thing I noticed during the figure assembly is that kit engineering is very intelligent. Using protrusions and indentations in corresponding parts, there is almost no possibility of misaligning the pieces. The fit is absolutely great and only minor putty work is needed to make things perfect. I would suggest some dry fitting to position both arms and the hands with sidearm... my plan to fix the right arm first, playing a bit with the left arm and hands to get the optimal alignment, worked really well. After fixing all the equipment pieces (large backpack with hydration tube, dump pouch, utility pouch and radio pouch), the assault rifle was added to the rifle sling sculpted on the figure using only a tiny ball of Magic Sculp. This was done so the weapon could be easily taken off the figure once the photo shoot was over. The figure represents US Special Forces operative firing his sidearm. The two-handed shooting pose of the figure looks very convincing; the head looks down the barrel of the gun, both hands holding the Sig Sauer P226 handgun firmly. Armed with HK 416 which features forward grip and AN/PEQ-15 laser illuminator, this figure means business. Afghanistan, 2011-2012 (AM35017) is an absolutely fantastic figure. Developed using 3D scanning process and delivered by rapid prototyping technology, the perfection is evident in just about every aspect of this kit… from the anatomy and the pose of the miniature to impressive resin cast with astonishing details on the uniform and equipment. The kit is intelligently engineered and very easy to assemble, turning the figure into one of the best depictions of US Special Forces operatives in 1/35 scale. Highs: A super realistic figure in a cool action posture. Combined with perfect resin cast, amazing details and ease of assembly, this is one of the best 1/35 scale figures on the market today. Well crap. As an 18B, I guess I have to give my two cents. Off the bat, great looking figure, great detail. That said... I have to be careful here. I've worked with 20th Group at their SOTD (Special Operations Training Detachment) at Ft. McClellan. They have some serious shooters there. I just hope the guy who posed for the 3D imaging isn't someone I know. I think a little adjustment of the pose is in order. The old Shep Paine trick of taking a cut out of the back of the knees and bending them a little more. Although the figure is bent forward at the waist, he's still back on his heels. You can see space under his toes. Not good for recoil management. Also, although he is looking down his sights, he appears to be bringing his head down to the weapon rather than the weapon up to his head. Finally, his grip bothers me. He's capturing his firing thumb with his support thumb. Less control there (muzzle flip) as well as a tendency to pull shots. The "front seat rear seat" arrangement of thumbs is preferred. If you showed me a photo of a dude having trouble with his shot groups and I had to assess him from that one photo, these are the things I'd point out. 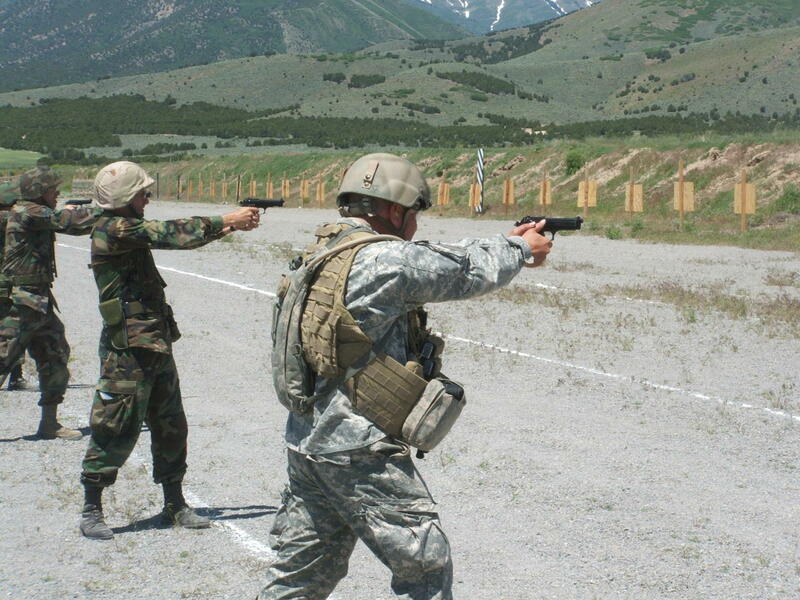 Here is what happens when SF guys attend shooting competitions with regular Army. Pistol higher than top of shoulders, aggressive stance, better thumb arrangement. The figure is not a total loss-change it up a little or use it as a guy in training, or change heads and make him regular army.